Here is xray vision into dustingetz.com, which integrates two data sources. Blue is dustingetz.com database. Green is a third party user database. 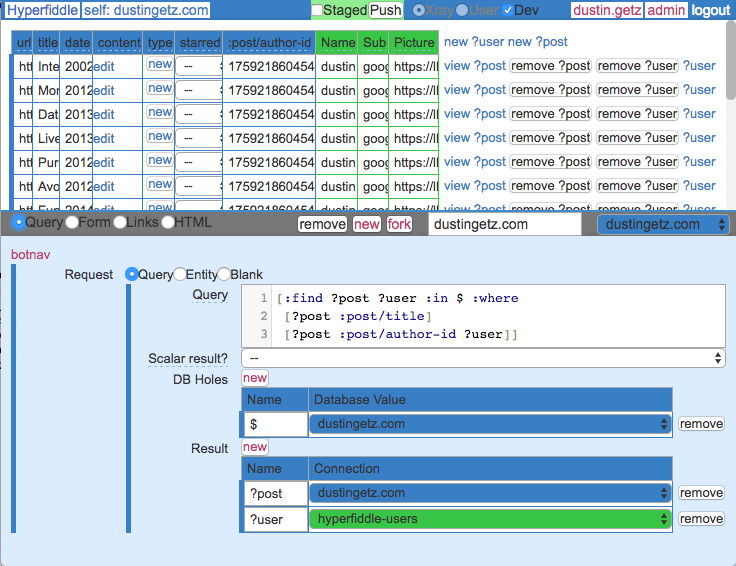 dustingetz.com's queries join across them securely. A 2017-era api cannot do efficient database joins across third party APIs. Hyperfiddle lets you do cross-database queries against any third party database in the Hyperfiddle network. Each API is different from the others, like a snowflake (or rather a turd). Each API is programmed differently, with different technology choices, different databases, and no way to do sophisticated queries across multiple systems. You have to copy the data out of one system and into your own system in order to query it. In 2017, to integrate with external systems, you need to coordinate teams across different organizations, buracracy quickly becomes the dominant cost. This is why Healthcare.gov cost a billion dollars. All Hyperfiddles have the same structure. They have the same API and the same type of database, Datomic. Datomic is a very special database. Datomic can merge several databases together and query them at the same time, as one. This is why fiddles can do cross database queries against any other fiddle. Mashing up third party data in Hyperfiddle has zero coordination cost, like adding a website to the world wide web has zero coordination cost. You don't ask for permission, you just do it. Hyperfiddle bypasses beauracracy. When I built dustingetz.com, I knew I needed to integrate with data from the green user database, because it is the source of truth for my name and photo. That green data is already in Hyperfiddle, so if I want to query against it, I need to put the blue data into Hyperfiddle too. The blue data also has to be in hyperfiddle because the whole point of using hyperfiddle in the first place is to efficiently join against green. Gravity. Hyperfiddle crowdsources the semantic web.